The rover that forms part of the Hayabusa 2 mission to explore the asteroid Ryugu is expected to touch down on its surface today. This is the second ever sample return mission to an asteroid, the first Hayabusa mission landed in Woomera in outback SA in 2010. The Hayabusa 2 rover, called MINERVA-Ⅱ1 began its descent on Thursday and at 10:30am Sydney time on Friday it was only 1.5 km above the surface and was travelling at about 10 cm per second. At around 4 pm AEST on Friday the Canberra Deep Space Communication Complex will take over communications for the mission. Dr Fred Jourdan is Associate Professor at Curtin University and director of the Western Australian Argon Isotope Facility. Landing those tiny probes at the surface or Ryugu is the first step taken before preparing for the part of the Hayabusa 2 mission that will involve sample recovery. The two little probes will bounce at the surface and take pretty pictures in the process. They will also measure the temperature at the surface of Ruygu. This is important, not only to know what the surface of the asteroid looks like (who doesn’t like close-up pictures of an asteroid! ), but because it will provide a critical context for the samples that will be grabbed at the surface by the main Hayabusa 2 probe latter in 2019. 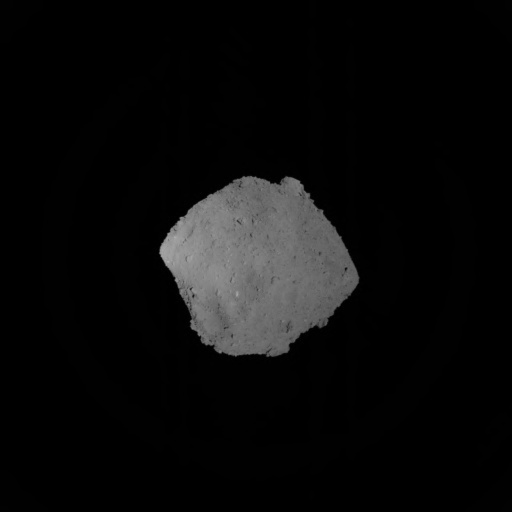 Is the surface made of myriads of tiny boulders like asteroid Itokawa visited by Hayabusa 1 before, or is it made of a single large chunk of rock? Ruygu is a carbonaceous chondrite asteroid, meaning it’s made of a fair bit of carbon and looking at the pictures so far, it seems that it is a rubble pile asteroid, made of fragments of a previously shattered parent asteroid. If so, were the carbon molecules heated and affected during the parent asteroid break-up process? If yes, in what way? Could such similar processes have had consequence on delivering carbon to Earth in its distant past (remember carbon + water = terrestrial life). This is just an example of all kinds of exciting questions we have at the moment and that can only be answered by bringing pristine material from Ryugu back to Earth. But for now, let’s simply enjoy the view, shall we? Exciting time! JAXA’s twin probes are in a slow-motion race into the history books, as the first rovers to land and move around the surface on an asteroid. The mothership, Hayabusa 2, has journeyed for 3 and a half years to reach the 1km target Ryugu, an ancient relic of the earliest days of our Solar System. This fossil will be mapped by the twin probes MINERVA II1A and MINERVA II1B as they carefully hop around the surface. The hopping probes have to be careful as the asteroid’s gravity is so weak its escape velocity is just 25cm/s, in other words you could easily walk right off the asteroid into space lost forever. Hayabusa 2 is only the third ever asteroid landing mission. In 2001, the NEAR Shoemaker spacecraft landed on the asteroid Eros, and in 2005 JAXA’s Hayabusa 1 not only landed on asteroid Itokawa but came home again – bearing precious grains of dust for analysis. There are big hopes that Hayabusa 2 and its two mini-landers will bring back much larger samples from asteroid Ryugu. It’s an exciting mission not only because of what it can tell us about the deep history of the solar system, but for the critical data it will provide for future asteroid mining. In the early 20th century, the Russian ‘father of spaceflight’ Konstantin Tsiolkovsky speculated about how asteroid resources could support a space economy. He’d probably be disappointed to see how far we’ve yet to go to reach this phase. We need to learn much more about asteroid composition and how it varies throughout the asteroid belt. There are more practical issues too, like adapting mining equipment to work in such low-gravity low-temperature environments. All the data Hayabusa 2 collects will exponentially increase our understanding of how to achieve this. The Canberra Deep Space Communication Complex (CDSCC), which is managed in Australia by the CSIRO on behalf of NASA, has been supporting the Japanese Aerospace Exploration Agency’s (JAXA), asteroid mission Hayabusa2 since its launch in December 2014. Throughout its four year joruney, CDSCC as part of NASA’s Deep Space Network (DSN) has provided two-way radio communication with the spacecraft, supporting telemetry, command and control of the spacecraft. The two mini-landers will ‘hop’ across the face of Ryugu taking images and using instruments to study the temperature of the asteroid and learn about its composition and gravity. A third Minerva lander will be deployed next year. After further mapping and characterisation of Ryugu from orbit, the Hayabusa2 spacecraft will make a final descent and will land to collect samples from the asteroid’s surface before returning them to Earth in December 2020. Hayabusa2’s mission is built on the experience that JAXA gained from its first mission to an asteroid with Hayabusa1 which landed on and collected samples from asteroid Itokawa, returning them to Earth in 2010, landing at a site near Woomera, South Australia. CDSCC will continue to provide tracking and communication with Hayabusa2 throughout the rest of its mission. Hayabusa 2 is an incredible mission - and I'm thrilled that the landing is finally upon us! To be able to fly to a tiny asteroid like this, move into orbit around it, study it close up, then have rovers land on it and explore the surface up close and person - that's just breathtaking! The whole goal here is to gather data that will help us to understand how the Solar system formed, and how it evolved to its current state - and Hayabusa 2 will be delivering material back to Earth from Ryugu, in just a couple of years time. The images coming back are amazing, but I think what really blows my mind is simply that we can do this in the first place. When I was a kid, growing up fascinated by space, we saw our first attempts to visit some of the Solar system's small bodies. Then, that meant simply flinging a spacecraft past the objects, tearing by for the briefest of flying visits. That we can now go there, land on the surface, and bring pieces back to Earth is just astonishing - it's an incredible technological feat, and we'll learn huge amounts from the data and samples we get back!